“Angela Duckworth is the founder and scientific director of the Character Lab, a professor of psychology at the University of Pennsylvania and the author of the forthcoming book “Grit: The Power of Passion and Perseverance.” This op-ed appeared in the New York Times, March 26, 2016. Judging Success and Failure of Schools and Districts: Whose Criteria Count? The dominant standard used by most policymakers, media editors, and administrators to judge success is effectiveness: Have you done what you said you were going to do and can you prove it? In a society where “bottom lines,” Dow Jones averages, sports statistics, and vote-counts matter, quantifiable results determine success. 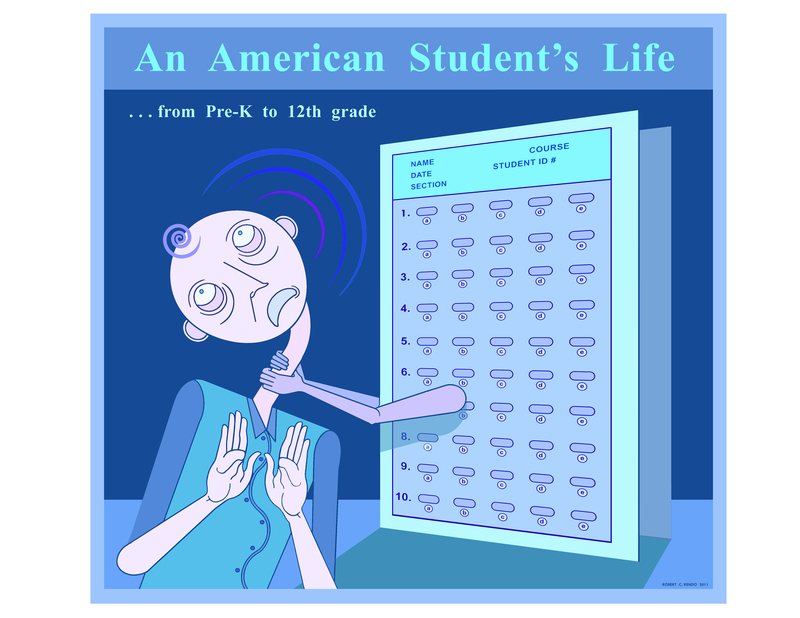 No Child Left Behind and its focus on standardized test scores is effectiveness on steroids. Yet even before No Child Left Behind, policymakers had relied on the effectiveness standard to examine what students have learned by using proxy measures such as state test scores, college attendance, and other indicators. For example, in the late-1970s policymakers concluded that public schools had declined because scholastic aptitudes test (SAT) scores had plunged downward. Even though test-makers and researchers repeatedly stated that such claims were false—falling SAT scores fueled public support for states raising academic requirements in the 1980s. What mattered most to decision-makers and media were numbers that could be used to establish school rankings, thereby creating easily identifiable winners and losers. Note, however, that test results in some instances proved unhelpful in measuring a reform’s success. Consider the mid-1960s’ evaluations of Title I of the Elementary and Secondary Education Act (ESEA). They revealed little improvement in low-income children’s academic performance thereby jeopardizing Congressional renewal of the program. Such evidence gave critics hostile to federal initiatives reasons to brand President Lyndon Johnson’s War on Poverty programs as failures. Low test scores, however, failed to diminish the program’s political attractiveness to constituents and legislators. Each successive president and Congress has used that popularity as a basis for allocating funds to needy students in schools across the nation including No Child Left Behind. Popularity, then, is a second standard that public officials use in evaluating success. The spread of an innovation and its hold on the imagination of voters, has meant that fashionableness can translate into political support for reform. The rapid diffusion of special education, bilingual education, accountability, and computers in schools since the 1980s are instances of innovations that captured both policymakers’ and practitioners’ attention. Few educators or public officials questioned large outlays of public funds for these popular reforms because they were perceived, at least at first, as resounding successes. A third standard used to judge success is assessing how well innovations mirrored what reformers intended. This fidelity standard assesses the fit between the initial design, the formal policy, the subsequent program, and its implementation. Champions of the fidelity standard ask: How can anyone determine effectiveness if the reform departs from the blueprint? If federal, state, or district policymakers, for example, adopt and fund a new reading program because it has proved to be effective elsewhere, local implementers (e.g., teachers and principals) must follow the original program design as they put it into practice or else the desired outcomes will not be achieved. When practitioners add, adapt, or even omit features of the original design, then policymakers, heeding this standard, say that the policy and program cannot be determined effective because of these changes. Where do these dominant standards of effectiveness, popularity, and fidelity come from? Policymakers derive the criteria of effectiveness and fidelity from viewing organizations as rational tools for achieving desired goals. Through top-down authority, formal structures, clearly specified roles, and technical expertise, administrators and practitioners can get the job done. Within organizations where rational decision-making and control are prized, policymakers ask: Have the prescribed procedures been followed (fidelity) and have the goals been achieved (effectiveness)? Hence, in judging reforms, those who carry out the changes must be faithful to the design before the standard of effectiveness in achieving goals is invoked. Popularity as a standard in judging success, of course, comes from the political domain. Schools are dependent upon taxpayers voting funds to operate schools. What voters determine is successful–regardless of the lack of or ambiguity in the evidence–gets renewed year after year. The authority and therefore the power to put into place one or more of these criteria in the U.S. derive from the 50 states (see Tenth amendment to the U.S. Constitution). States establish local districts which directly govern its schools–there are about 14,000 districts in the U.S. California has over 1,000 districts, Virginia has 227, and the state of Hawaii governs all of its schools as one district. States, then, set overall criteria for success. Most states choose effectiveness criteria with occasional bows to popularity and fidelity. Local districts run the schools and try to meet those criteria. Since 2002, however, federal legislation–yes, the No Child Left Behind Act–sets effectiveness criteria–test scores–for the states which then, in turn, demand that local districts adhere to that standard. The entire debate in the U.S. Congress to reauthorize NCLB has hinged upon who will have the authority to set the criteria for success, the federal or state government. Oracle CEO Larry Ellison earns $37,692 an hour. No, that is not a typo or misplaced comma. Ellison’ annual salary ran $78.4 million, much of it in stock option awards. His salary was based on the annual performance of the company’s stock. Oracle’s Board of Directors set the pay scale (Ellison owns one-fourth of the company’s shares) to spur better management to increase profits and shareholders’ dividends. They pay Ellison to perform well on the metric they have chosen (“company earnings before income taxes minus the costs of stock-based compensation, acquisitions, restructuring, and other items.” This CEO’s performance pay is not, however, a metric used by other major corporations for paying their top person. I return to the point of different measures used by companies to judge CEO performance later. Switch now to the average U.S. public school teacher who earns an annual salary of over $55,000. That figure translates to around $27.00 for a 40-hour week. Like Ellison, hundreds of thousands of teachers are involved in pay-for-performance plans. 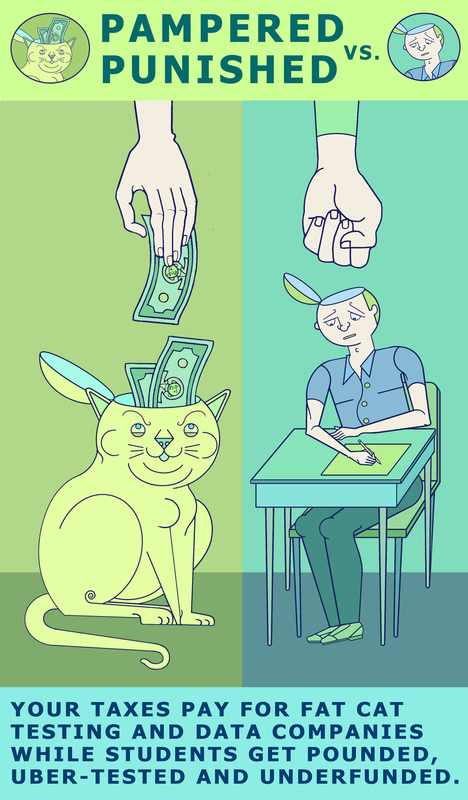 In response to the federal Race To the Top competition, many states have mandated that teachers’ performance and salary be tied to students’ test scores to spur better teaching and student learning. Those test scores, as a factor in assessing effectiveness and determining salary (or bonuses), can range from as much as over half to one-quarter of the decision to set salary and retain or fire a teacher. While I have written about this pay-for-performance reform over the past few years (see here, here, and here), for this post I want to inspect how the private sector–often a model for U.S. school reform–has its own problems, often undisclosed by business-oriented champions of school metrics, in determining CEO pay. The lesson to learn from this post is: Paying for CEO performance in companies and schools is as flawed as the measures used to determine it. A recent study of the metrics used in 195 large companies over the past five years showed that the most popular gauge measuring CEO performance was “total shareholder return.” Over half of the companies using that measure, however, lost nearly two percent over the five-year period. Companies using less popular equations such as “earnings-per-share growth” gained almost three percent. Now, here’s the clincher. Most companies judging CEO performance are relying on a metric that yielded loses for investors (“total shareholder return”) yet, at the same time, those very same companies continued to give their CEOs substantial raises year after year. The authors of the study believe that the popularity of the performance measure, i.e., “total shareholder return,” stems from how easy it is for boards of directors and CEOs to manipulate the metric by “removing costs from the equation” such as “discontinuing product lines or closing factories.” Boards of directors then can reward CEOs with higher compensation packages. Earnings-per-share growth, a less popular metric and one of multiple measures that many firms use, sorts out under-performing from high performing firms, the authors found. This one as well as other measures, they concluded, are less easily manipulated by top corporate officials. CEO pay, then, can be better associated with company performance. The main takeaways from this study is that boards of directors and CEOs do manipulate the numbers, “one size does not fit all when measuring pay for performance,”and that multiple measures for determining effectiveness and salary have a better chance of capturing performance than single ones do. Now, consider teacher pay-for-performance where one measure–student test scores–is often used to determine to what degree a teacher is effective. Like “total shareholder return” there are serious problems of using this metric alone or even in concert with other measures to judge teacher performance (see here and here). Since the mid-1970s, social scientists have criticized the use of specific quantitative measures to monitor or steer policies because those implementing such policies alter their practices to insure better numbers. The work of social scientist Donald T. Campbell and economists in the mid-1970s about the perverse outcomes of incentives was available but have largely been ignored. Campbell wrote in 1976. That was nearly forty years ago. In the past decade, researchers have documented (also see here) the link between standardized test scores and narrowed instruction to prepare students for test items, instances of state policymakers fiddling with cut-off scores on tests, increased dropouts, and straight out cheating. Although how the distortions occur are unclear, the evidence confirms Campbell’s insight. Few in business, medicine or education question that some indicators are easier to quantify than others. In medicine, for example, hospital mortality and surgical procedures are fairly easy to measure but the results even when compared to other hospitals and surgeons hide as much as they reveal about effective health care. So it is with standardized tests. Because test scores are inexpensive and efficient to collect, they draw attention away from important but hard-to-measure aspects of teaching and learning such as student engagement, rapport between teachers and students, academic climate in classroom and school, and principal leadership. Cumulative practitioner experience and stories about teaching over centuries have established these as crucial factors in working with gifted and vulnerable students. These are known results of using single measures to judge individual or organizational performance. Consequences of their use can be anticipated. Historical examples abound. Some districts (e.g., Denver) wisely have moved to using multiple measures with student outcomes included that go beyond test scores but in most states where such mandates reign, test scores still remain a major part of the equation used to judge teacher performance (e.g., New York City, Washington, D.C., Houston, Texas) and allocate bonuses to teachers and principals. This manipulation of data and one-size-fits-all measures show up in businesses as well as schools raising serious questions about the worth of this frenetic passion for pay-for-performance in both public and private sectors. In the meantime, if Oracle’s Larry Ellison read this post in his office–say 10 minutes–he would have earned over $6,000. Ah, to be a CEO. *If you have reached the end of the piece and have not yet figured out that The Onion specializes in satire, parody, and comic humor, I want readers to know that this is a fictitious article poking fun at U.S. school reformers’ obsessive focus on international test score comparisons, the supposed high quality of Chinese education and perceived low academic quality of U.S. high schools. Thanks to Joel Westheimer for sending this piece to me. 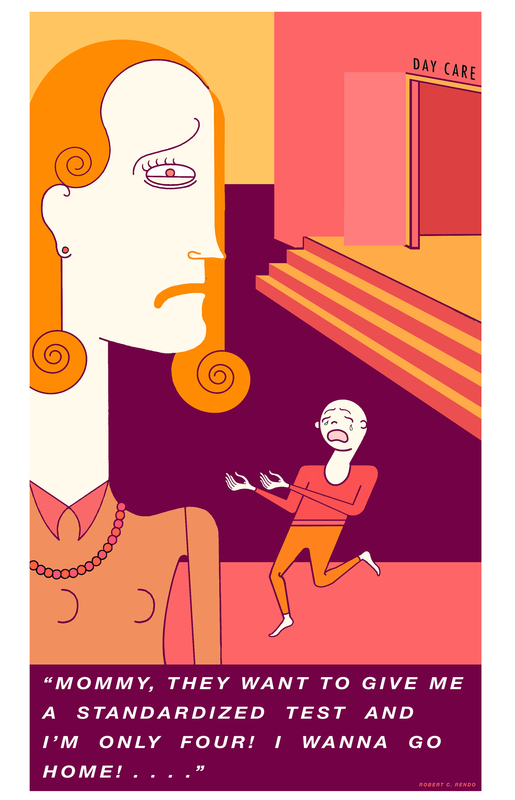 For this month’s feature on cartoons*, I chose a selection from Robert Rendo. 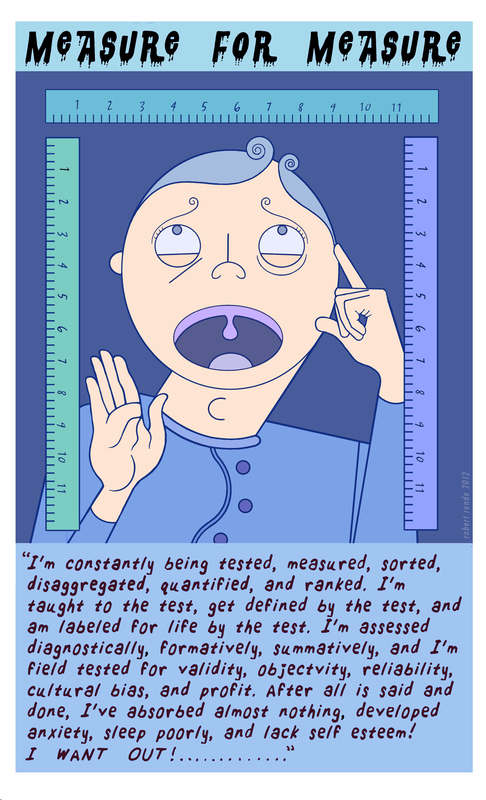 We met through my blog and he sent along a sampling of his cartoons from which I selected some on students and testing. He sent me the following description of himself. Robert Rendo grew up in New Hyde Park, New York. He lives in New York City and in Massachusetts with his wife Rachel, an educator and children’s clothing designer. Robert Rendo is an editorial illustrator and president of PoliticalCartoonsOnline.com. A native New Yorker, Mr. Rendo’s work has earned him publication in the Op/Ed section of the New York Times, the Chicago Tribune, and the Sacramento Bee. Recently, Rendo designed the logo, masthead, and branding for educational historian Diane Ravitch’s Network for Public Education. His images can also be found on Stephen Krashen’s blog, Education Notes Online, and the blog “Susan Ohanian Speaks Out”.